Once known as Thebes, Luxor served as the base for Egypt's ruling class for thousands of years, and its temples and tombs are among the wonders of the ancient world. 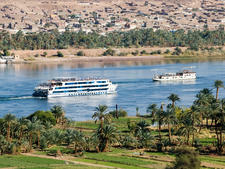 Almost all Nile River cruises embark from the Luxor cornice, a pedestrian pathway on the river's East Bank, and you'll likely spend at least two days exploring ruins in the surrounding area. The city itself is concentrated on the east side of the Nile, where you'll also find the Temple of Karnak -- the world's largest ancient religious site -- as well as Luxor Temple and the bulk of Luxor's museums, hotels and restaurants. 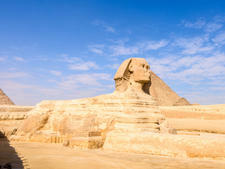 The West Bank is home to some of Egypt's most famous tombs, including the necropolis within the Valley of the Kings and the Valley of the Queens, and memorials like the Colossi of Memnon. If the temples become tiring, take a break to check out some of Luxor's more "modern" attractions (modern being relative when your city dates back past 2,134 B.C.). Of these, the Old Winter Palace -- now a hotel run by Sofitel -- provides afternoon tea, a refreshing break from the city's hot desert climate. And, of course, many tourists can't leave Luxor without taking an early morning balloon ride over the ruins; even if you're not the one aloft, their colorful fabric makes for wonderful pictures against the typically bright blue sky. Port areas along the Nile River are small and typically feature little more than stalls selling the usual souvenirs. Luxor's port is not much more than a mooring spot. Most boats dock in central Luxor, along the lower corniche (the main boulevard along the Nile) or out of town in the Boghadi Zone by the bridge. Ships will commonly will moor side by side, though some upmarket cruise lines have private docks. Ocean cruise liners that offer excursions to Luxor tie up farther out at Safaga Port, which is situated on the coast of the Red Sea. 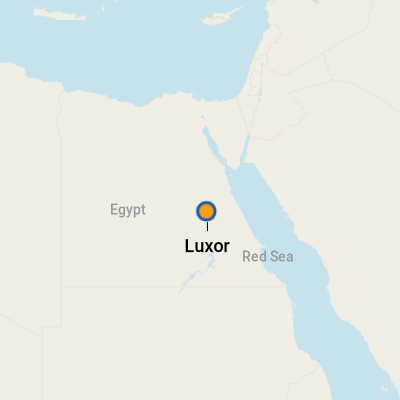 Tourist facilities at Luxor's port are few and far between. Also, it is not unusual to see heavily armed security personnel at the port. Time spent at each port is generally filled with planned excursions, and you can find the facilities you need onboard or in nearby hotels. In Safaga, travelers will find great diving, windsurfing and a range of hotels. Safaga's town center is about 1.5 miles from the port and has a few shops for general items, as well as a bank. Caleches, known locally as hantours, are the horse-drawn carriages you will see dotted along most Luxor streets. Drivers and touts will pester you, offering you rides -- and they can be quite pushy. Some of these horses look rather uncared for, so it might be best to avoid them. (The mistreatment of horses in Luxor and other Nile cities is an ongoing problem.) Also, be aware that many of the drivers are keen to make an extra buck, so be sure to agree a price first, and clarify exactly where you want to go. If the tour is getting longer than you want, ask to be dropped off, and get a taxi back to your ship. By Taxi: If you want to travel separately from the planned excursions (for which you'll generally catch a pre-booked coach), it's best to take a taxi to the sights. They have no meters, but drivers should offer you a fixed current rate to reach your destination. By Ferry: You can go between the East and West banks by road, but taking a ferry is easier, quicker and cheaper; the national ferry runs all day and night, leaving from the pier opposite Luxor Temple. Make sure you get a return ticket. The currency in Egypt is the Egyptian pound (LE). Visit www.XE.com for current rates. U.S. dollars and other hard currencies are generally accepted, and you can change money at the visa offices in the airport arrival hall. There are ATM machines inside upmarket hotel lobbies, including the Sofitel Karnak, the Lotus and the El Luxor. Keep small change handy for minor purchases and for tipping, which is a way of life in the Middle East. Paper money gets very tattered and torn, especially the smaller notes, and may be refused by vendors. 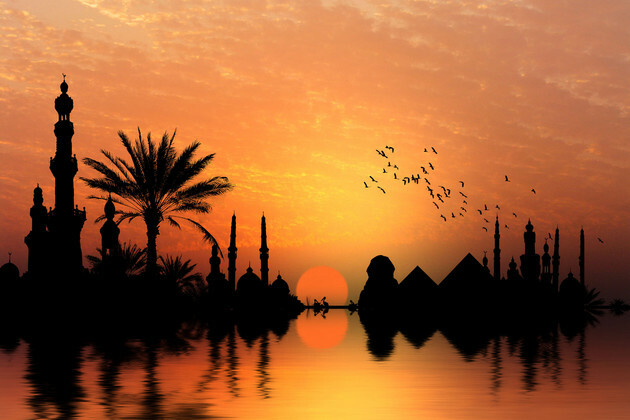 Egyptian Arabic is the commonly spoken language, but English is also widely spoken. Those directly involved with tourists, including vendors in the market, speak many European languages -- and even some Japanese. An Egyptian meal often begins with pita bread and a selection of delicious appetizers, such as baba ganoush or taboule. Main courses might include meat or poultry and be accompanied by yogurt or gibna bayda, a creamy feta-like cheese. As with any popular tourist area in Egypt, it's never hard to find Western food in Luxor. Alcohol is generally not consumed by Egyptians, but imported wine and beer can be found in most hotels and some restaurants. Locally produced alcohol is less expensive, but some varieties, especially the wine, can be an acquired taste. Hotel Dining: Many of the hotels have fantastic restaurants. The Sheraton has four to choose from, including La Mamma, which offers pizza and has a beautiful outdoor setting. The Old Winter Palace also offers two well-regarded restaurants. On a Budget: The Lantern Restaurant is British-owned and offers tasty and reliable English and Egyptian food. It's hard to leave Luxor without that special souvenir. Visitors will encounter a wide number of street vendors and roadside stalls. Popular items include carvings of gods, pharaohs and queens; glass scent bottles; papyrus sheets with hieroglyphic writing; replicas of popular archaeological artifacts; Coptic textiles; jewelry, copper dinnerware and spices. For a personalized papyrus, visit the Papyrus Institute.